Luckily, there is another option that lowers the financial burdens involved in ownership and provides more flexibility: mobile franchises. 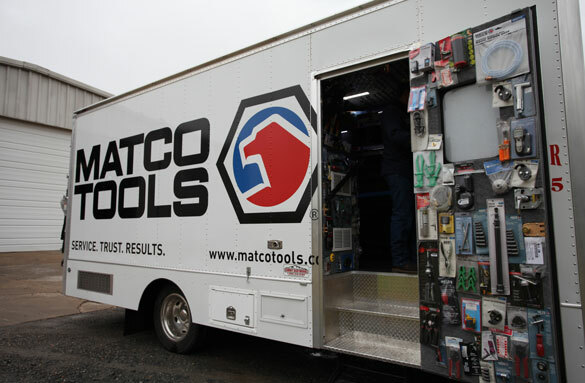 Mobile tool franchises like Matco Tools have been around for years and are a popular option over a traditional brick-and-mortar franchise. Deterred by the amount of capital you need to start a franchise? With a tool store franchise, some of the most significant start-up costs are lower. For example, purchasing or renting space in a building can be a huge expense, depending on the size of the space, property taxes, additional fees and the real estate market of a particular neighborhood or area. The costs associated with stocking a store with merchandise can also be high. When purchasing inventory for your Matco truck, you’re likely spending a lot less than you would to fill wall-to-wall displays in a store. In addition to lower start-up costs, Matco Tools has multiple in-house financing options for qualified candidates, no royalties, advertising or franchise fees, and military veterans are eligible for a special $10,000 incentive. #2 A Reliable Workforce – YOU! There is no doubt being your own boss can be highly satisfying. Likewise, having no employees to hire, train and manage has its perks, too. Mobile franchises are usually smaller and easily managed by one or two people. When you don’t have to spend time and money on employees—including salaries, benefits and tax obligations—you can focus your resources on building solid relationships with your customers. Current Matco distributors often say one of the most rewarding aspects about their tool franchise is knowing the success they achieve is a product of their own hard work. Managers, coworkers or anyone else can take credit for the time and effort they put into their job, but with a Matco franchise you earn all of the credit. Tool truck franchise owners have the luxury of setting their own hours and schedules, unlike those who operate traditional franchise stores, which must follow set operating hours. Matco distributors can decide the best times for calling on their customers, and they can arrange their days to accommodate other activities and important responsibilities, such as childcare needs or school events. Many Matco owners find that their automotive franchises allow them to have the kind of lifestyle they want. One of the biggest challenges of owning a business is increasing awareness and traffic at a store location. Mobile franchises allow owners to travel to their customers instead of waiting for customers to come to them. What’s more, Matco trucks provide free advertising as owners travel from location to location, and it continues wherever the truck is parked. Every new Matco franchisee receive classroom and field training to learn the ropes of operating a mobile franchise, along with a list of at least 325 potential customers within your market, providing you exposure from the very beginning. The support does not stop there: All Matco distributors receive professional support from their district managers and other distributors even after the initial training process. In fact, Matco provides more training than any other mobile tool franchise. Traveling directly to a customer helps build trust and strengthens the relationship. Instead of one-off interactions, calling on customers allows mobile franchisees to get to know not only their customers’ names but also their concerns, interests and even their employees or associates, creating additional ties that may be useful if your customer contact leaves the company. Thanks to the potential customer list that Matco provides, new distributors can begin the process immediately, building relationships and making sales with key customers, which include technicians and garage shop owners. Often customers need a product but do not have the time or resources to get to a store to purchase it. Mobile franchises bring the products directly to the customers, making it easier for them to make purchases and, as a result, increase sales for the franchisee. Even if a product is not in stock, customers know they can trust their Matco distributor to order the product quickly with virtually no hassle. With low start up costs and exceptional ongoing support, Matco Tools’ mobile franchises give owners the chance to make a good living. You can read about franchisees’ success story experiences. Many Matco tool franchisees say they enjoy opportunities associated with mobile franchising that aren’t available through other jobs or other franchise options. Some of these franchisees tell us they couldn’t be happier with their mobile tool stores. If you want the freedom to run your own business without the financial burdens and restrictions associated with a fixed store location, mobile franchises are an excellent option. Sign up for a Matco Tools mobile franchise to start taking advantage of these benefits.